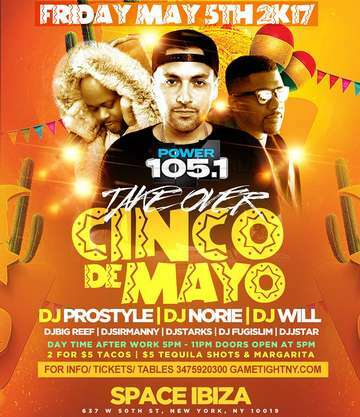 POWER 105.1 CINCO DE MAYO PARTY AT SPACE IBIZA – SPACE NIGHTCLUB - HOTTEST CINCO DE MAYO POWER 105.1 FRIDAY NIGHT WITH DJ PROSTYLE, DJ NORIE, DJ WILL – CINCO DE MAYO PROSTYLE LIVE! POWER 105.1 CINCO DE MAYO AT CLUB SPACE IBIZA NYC WITH MUSIC BY NYC HOTTEST DJS POWER 105.1 DJ PROSTYLE, DJ WILL, DJ NORIE! SPACE NIGHTCLUB WITH POWER 105.1 PARTY TICKETS ! TICKET EVENT 21 & OVER! DJ PROSTYLE CINCO DE MAYO PARTY @SPACE IBIZA NYC WITH DJ WILL & DJ NORIE! CAPACITY EXPECTED! BUY YOUR TICKETS NOW FOR 10$! Cinco De Mayo Dj Prostyle at Space Ibiza Dresscode: Guys Dark Sneakers okay with Collar Shirt or Button Up, Ladies Shoes! Power 105.1 Cinco De Mayo Dj Prostyle at Space Ibiza Bottle Packages: Bottle Prices available by request.